Zenith was situated in a marquee on the central tennis court at the Barcelona Royal Polo Club, where they wholeheartedly lent their support to the Foundation established by former French footballer, Eric Abidal. 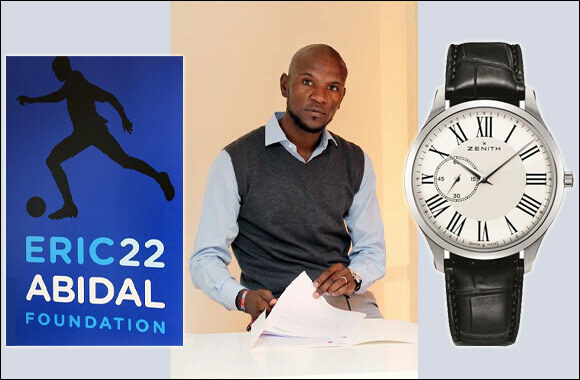 The Swiss watch brand helped raise funds for the Eric Abidal Foundation and its projects that are aimed at improving the lives of children and teenagers fighting cancer on a daily basis. Zenith’s presence did not just last throughout the weekend during the matches and tournament, but it also extended its support and involvement in the gala dinner held at the Fairmont hotel. For the event, the brand donated two watches for the fundraising tombola that was drawn during the dinner on Sunday evening in the gardens of the Fairmont Rey Juan Carlos I hotel. All the funds raised from the sale of the tombola tickets have been donated to the foundation to help in its fight against cancer. In the game that was open to everyone in attendance, two lucky winners took home a treasured Zenith model each: The Elite Ultra Thin Lady for ladies and the Elite Ultra Thin for men. A nostalgic weekend of tennis, the Classic Tennis Tour tournament is now a few years old, but this is the first time it has taken place in Barcelona. It was a true celebration of tennis over the weekend, particularly for those who love the sport and desire to reminisce about old times. In addition, it also proved to be a valuable learning opportunity for younger players. Centre court saw the return of Sergi Bruguera, Ilie Năstase, Henry Leconte and Mansour Bahrami, among others while there were also matches that had future tennis stars playing against these greats. All in all, it was a fun and friendly event where everything took place on centre court at the Barcelona Royal Polo Club. Zenith along with the special Tombola, aided in raising funds for the foundation's projects that aim to fight cancer; especially projects tailored to improve the lives of children and teenagers suffering from cancer, as well as their families. All this assistance comes as part of a sporting event that not only takes patients' physical recovery into account, but also their emotional recovery and their desire to improve. To support this event and buy a ticket for the tombola, attendees simply needed to come to the Barcelona Royal Polo Club. This has been one of the first joint events to be held following an agreement that was signed by both parties last March. This relationship exemplifies the vision shared by Zenith and the Foundation: Dreams can become reality, and tenacity and being valiant in the face of adversity are the most important. The partnership was announced on 22nd April at the InGracia centre http://www.ingracia.com/eng/ in the heart of Barcelona, in the presence of the footballer and his wife Hayet Abidal, Director of the Foundation.